By Kathyrn E. Holland Braund, ed. 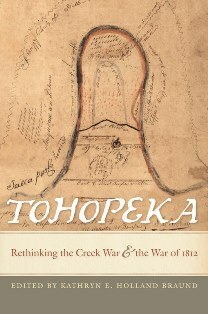 The Battle of Horseshoe Bend, also known as the Battle of Tohopeka, was a turning point in Creek (Muskogee), Alabama, and American History. Set within the larger context of a newly established America, continuing clashes between the settlers and the tribes for land, and the War of 1812, the Battle at Tohopeka made Andrew Jackson a national hero with both military and political clout. The list of contributors is impressive, offering a mix of historians whose work is widely known to readers in addition to historians, archivists, and preservationists whose work may not be as familiar. Each of the essays add gravitas to the on-going studies of the battles of the Red Sticks—the Canoe Fight, the Battle of Holy Ground, and the Battle of Tohopeka. The contributors use literary and linguistic analysis, cultural and religious practices, and new archaeological research to create a broader interpretation of Alabama History. The maps, charts, and, most notably, the selected bibliography offer the reader depth and context. All of the essays are readable, lively, and designed to stimulate conversation on the relationships and tensions between the factions involved in the war, the events leading up to the war, and the historiography created—and evolving—after the war. The research is careful, thorough, and important. Pam Kingsbury teaches in the English Department at the University of North Alabama.